SUPERIOR CUTTING AND COLLECTION PERFORMANCES. Also available with electric cutting height adjustment and electrically operated grass collector. 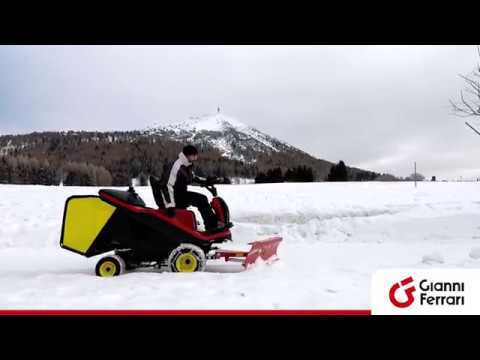 The Gianni Ferrari GTR is an out-front mower which combines extremely simple use with professional performance, and appeals to both enthusiastic estate owners and contractors who need a nimble, compact machine. The out-front cutting deck provides maximum visibility and perfect control. The front deck cuts the grass before the machine passes over it, making a clean cut. The front deck also able to cut under bushes and makes finishing around trees, flower beds and walls easier. A carrier frame holds the deck in a suspended position, so it can float following terrain contour, ensuring an even, precise cut. The deck carrier frame is fitted with non-puncture wheels, in full soft rubber. The front lifting device allows to raise the deck rapidly thus enabling the machines to mount kerbs and other obstacles. The swing back blades absorb shocks and protect the transmission against various debris left in the grass. The blades are able to cut extremely tough grasses such as couch, with a high quality of cut. The heavy duty electric PTO clutch can be adjusted to ensure long life and positive engagement. The counter-rotating blades provide a strong aerodynamic thrust, forcing the cut grass directly into the collector. The collection chute is shaped to follow the parabolic trajectory that the grass is naturally given after cutting, providing optimum flow without energy loss, and better compaction of the grass in the collector, as a result. The direct collect system of the grass avoids clogging even in tough conditions with tall, moist grass. The special design of the chute helps fill the collector to the optimum level and, together the outstanding grass compaction, it means an even greater capacity. The collection chute is fitted with a hatch for easy inspection and cleaning. The 280 litre collector has a remarkable filling capacity. Grass collector is a mesh bag treated with an anti-UV additive and has a steel tubular frame. The audible warning advises the operator to disengage the PTO when the collector is full, thus preventing the obstruction or clogging of the collection chute. Collector dumping is servo-assisted by a gas spring that reduces strain on the operator and is controlled from the driver’s position through the activation of a lever. The bottom of the grass collector can be easily removed for cut-and-drop rear discharge. Mulching is also possible by fitting the optional kit to the collection deck. 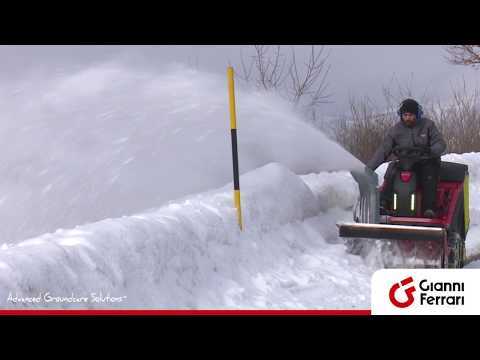 GTR is powered by commercial 2-cyclinder petrol engines of 16 and 20 HP, designed for industrial applications and hence high performance even in most demanding operating conditions. The engines feature a number of advanced technologies and integrated components such as Over Head Valves (OHV) for low vibration, lower emissions and better fuel economy. While the dual air filter and the pressure lubrication system with oil filter protect the engine and extend its working life. The large 19 liter fuel tank allows for longer work periods without refueling and is equipped with a convenient fuel level gauge. The power transmission to the wheels is obtained through a strong hydrostatic transaxle with high torque. The transaxle has a hydraulic oil filtering system guaranteeing transmission reliability over time. Strong 25mm axles drive to flanged hubs with 4 bolt wheels for easy tyre maintenance. A single quick and intuitive pedal controls the forward and reverse directions for maximum simplicity in use and a dampener ensures a smooth driving sensation even when changing direction or braking. The wide tyres provide excellent grip and are light on the lawn. Two counterweight springs transfer part of the weight of the cutting deck to the drive wheels for a better grip and efficiency of the drive. A steel sump guard protects the transaxle, clutch and other parts from possibly knocking against kerbs, rocks, and roots. The steering is light and precise. The strong and sturdy steering mechanism is rack-and-pinion type with a drag link to the rear wheels. Rear-wheel steering provides easier maneuvering with a very tight turning radius, making the GTR sprightly and nimble, reducing the need for finishing and hence mowing time. The low centre of gravity and weight distribution on the axles adds more driving comfort. A really pleasant and simple drive experience! The rear oscillating axle swivels on ball bearings and is constructed in single block, press-forged steel, for maximum sturdiness. The driver’s seat of the GTR has been designed to offer maximum ergonomics and comfort in use. 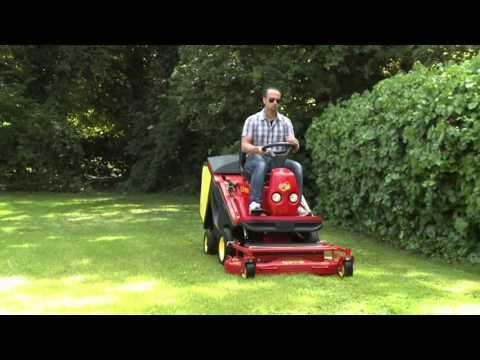 The fore/aft adjustable seat is located at the front of the machine, and along with the high seating position enables better visibility all around while mowing or driving. The high backrest and the comfortable embracing padding allow operators to work tirelessly for lengthy periods. The ergonomically designed steering wheel has a soft grip and steering knob. Steering is light, precise and sturdy. All controls are user friendly and are located within easy reach. The cutting blades are engaged by means of electric switch to an electromagnetic clutch. The standard equipment on the GTR includes a digital hour meter and headlights. The Gianni Ferrari GTRs are easy-to-handle, compact machines endowed with high productivity features and superior cutting and collection performances.